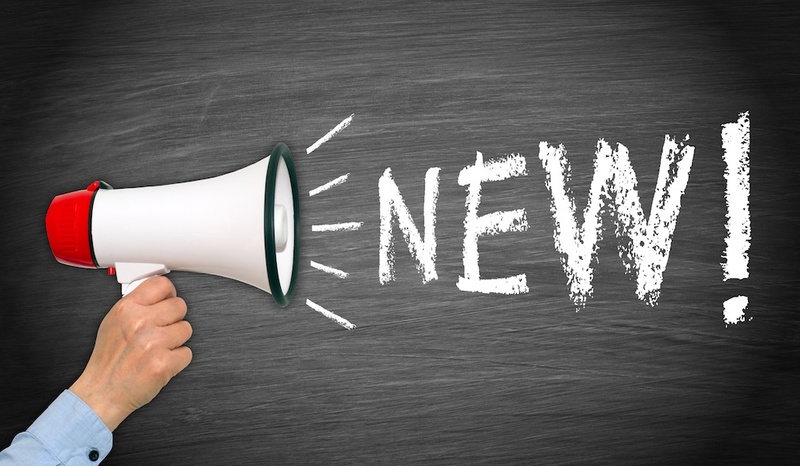 Announcing 8 New Work Order Features! Email Client and Smart Duplication Checker are Available Now. The Maintenance Care Team is happy to announce that we have added eight brand new features to our CMMS maintenance software. With these new additions, we’re hoping to make work order management even more effective and efficient for users and maintenance teams. The biggest additions, a new Email Client and Smart Work Order Duplication Checker are completely free additions to our Work Order Edition and Enterprise Edition users. 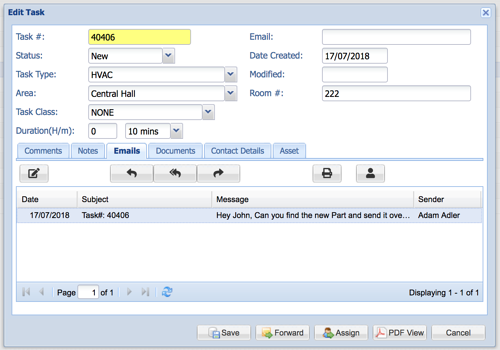 The internal Email Client will allow users to keep track of all communication regarding work order requests and tasks. You can: compose emails, create a contact list, send new emails, reply to emails, forward emails, attach files and print attachments. Because all email history is tied directly to the work order/task, you can get a better picture of how the task evolved. 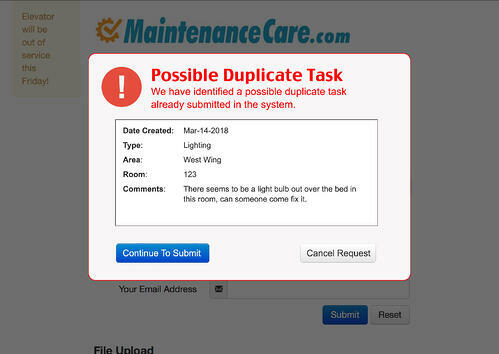 The Smart Work Order Duplication Checker will allow users to cut down on duplicate tasks, saving maintenance teams time and headache. The optional feature will allow users to be warned if a request they are submitting is similar to one that already exists. Auto-Assign: When a new Task is created, the task can now be Auto-Assigned to a user based on the type of task or where the issue is in the building – Task Type or Building Area. New Task User Assign: Users can be assigned to tasks during the creation of the task rather than as a second step. New User Welcome Email: When a new user is created, there is now an option to send them an email invitation to log into Maintenance Care. Asset Document Linking: You can now not only upload a document to attach to an asset, but you can also link an existing uploaded document from the Space Center to the asset. This will save on the amount of space you utilize in the document upload limits. Notes Column: Users can now view the Notes column in the Task list. Web-Enable Building Area and Task Class: When your maintenance team creates a Building Area within the Facility Profile, they now have the option to make it available on the external request link (Maintenance Request Page), or to just have it as an option internally for the maintenance team to use. The same can be done for Task Class as well. A visitor will only see a list of Areas or Classes that are web-enabled.